A convincing six-try first half performance was the basis of Leighton Buzzard’s 48-7 victory against bottom side Ilkeston, lifting them out of the Midlands 1 East relegation zone. With just seven points separating six teams, Leighton are by no means out of trouble yet, especially as they face second place Kettering next week. They wasted little time against Ilkeston, taking just three minutes for flanker Adam Stacey to score the opening try as the pack drove over the line. Geoff Branwhite converted from the touchline. Five minutes later similar driving play provided the opening for Branwhite, playing at scrum half for the first time this season, to score the second try. With the conversion Buzzards led 14-0. With such an encouraging start, Leighton slightly relaxed allowing Ilkeston to be more competitive before a fourteen minute, four try burst effectively sealed the result. 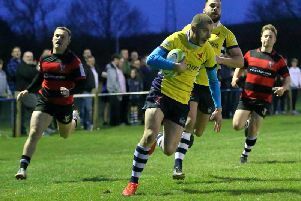 Ryan Fraser drove fifty metres into the Ilkeston twenty-two area - whilst the ball was cleared into touch, a clever move from the resulting lineout allowed Fraser to touch down. Five minutes later good handling skills allowed full back Ben Beaumont to add his name to the try scorers list and, with the last play of the half, Mike Lynch also scored to leave the score 36-0 at the break. With the game effectively won, Buzzards started the second half in a lacklustre manner. Credit is also due to Ilkeston, who despite their near-hopeless position, played with considerable spirit and determination. As a result, it was almost half- way through the half before Leighton added to their score – replacement scrum half Jordan Marshall made the decisive break and delivered the try-scoring pass to winger Ollie Taylor. Geoff Branwhite added the conversion to put the Buzzards 43-0 ahead. Ilkeston were now running their limited possession with increased intent; following a good break and quick hands a last-ditch high tackle prevented a score so the referee correctly awarded a penalty try. With the conversion of the consolation try, the score was 43-7. Perhaps irritated by conceding and almost straight from the kick-off, Euan Irwin intercepted a pass to score Leighton’s eighth try of the afternoon. The remaining fifteen minutes were played out mostly in midfield leaving the final score 48-7. Leighton move up to eleventh place with 43 points – a total that would have ensured survival comfortably last year. However with only seven points separating seventh to 12th place, Buzzards know they must keep picking up points in a very tight league.